In the late 19th century, shepherd-dog fanciers met to determine the type and character of the breed to be known as the Belgian Shepherd dog. Belgian breeders agreed on the conformation and talents of a first-class herding dog but differed on the proper coat. So we have a breed with four varieties of coat, each named for the area where that particular coat was favored. Little was known of the Belgian Shepherd dog in North America until after WWI when returning service men told stories of the breed's records as messengers and Red Cross dogs. Until 1959 all three breeds of Belgian sheep herding dogs were known as Belgian Sheepdogs. the breed we know today as the Belgian Sheepdog [properly called the Groenendael) had been here since 1907, when the first five dogs were imported. The dog we now call "Belgian Malinois" arrived in the USA in the late 1940's, the Belgian Tervuren in 1954. By 1959 the AKC had separated the 3 into distinct breeds and only the black (with occasionally a very little bit of white), medium-to-long-haired dog is today called and shown as the Belgian Sheepdog. These intelligent dogs have been used extensively for police work in Europe and other parts of the world, including here in the USA, and indeed may have been the first breed in Europe to be trained for such work. They are loyal and willing dogs who want to please their owners. They are affectionate with people they know but are suspicious of strangers. They were first used as patrol and courier dogs in WWI, and hundreds gave their lives in battle. Groenendaels are fearless and will attack anything they feel threatens their family and their home. They are possessive and territorial, like all breeds bred to guard home and flocks. the Belgian Sheepdog is not at all casual about their responsibilities. This is a breed that needs a lot of emotional and physical stimulation, every day, and therefore are not a great choice for 1st time dog owners. If this is a breed you fancy, you should have the character to want to spend a lot of time training and interacting with them ~ or choose something less interested & in demand for daily stimulation. This is a breed that does well in cold climates. They excel in rough, tough outdoor assignments. Training should start early with this intelligent, ready for work, dog. Their distrust for strangers needs to be handled and in control by their owners. This is a breed that demands you to be in charge or else they have no problem taking the lead. The breed is also known as Groenendael, Belgian Sheepdog, Belgian Shepherd Groenendael, Belgian Shepherd Dog, Chien de Berger Belge. 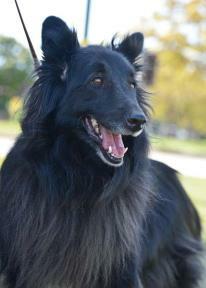 The belgian shepherd dog were originally bred for herding sheep. Belgian Shepherd Dog is a brilliant herding dog. In Australia, New Zealand and the United States herding dogs are known as working dogs. They sometimes are brilliant guard dogs. They may be trained to target the arms and legs of intruders. Belgian Shepherd Dog is a number of the breeds with the highest intelligence. All perspicacious dogs needs mental challenges to thrive. Belgian Shepherd Dog cause less shedding than other breeds. The dog breeds do require a lot of brushing and grooming. Belgian Shepherd Dog is considerably easy to train. Even for beginners it's not to educate this dog breed. Careful dog training is mandatory as the Belgian Shepherd Dog is a considerably umbrageous dog breed. The Belgian Shepherd Dog is one of the breeds with the highest energy levels. The breed requires a lot of workout. The dog breeds may be suspicious of uninvited persons. Can be a bit dog aggressive. They are children friendly and good with kids. These animals may reveal some predatory tendencies. They may crunch, but it is not always instinctively. This breed tend to bark loudly and excessively. Although the Belgian Shepherd Dog can live in considerably hot climates, it's not the ideal contidions for this dog breed. They can handle freezing temperatures and can adapt to cold climates. This breed is one of the most playful of any dog breed. The Belgian Shepherd Dog can get used to be home alone for a few hours every day. Origin: was first created in Belgium. These dogs are popular in local dog shows around Brussels. Belgian Shepherd Dog classification: Belgian Shepherd Dog is acknowledged in the Federation Cynologique Internationale registry. •	Not an apartment/condo size dog. •	Require lots of exercise and mental stimulation. •	One of the most sought after breeds for police work in Europe. •	Good with other pets if introduced and brought up with them, otherwise will chase small pets. •	Good with children & very protective of family kids. •	Will chase cyclists, cars, joggers ~ need to be leashed. •	Not recommended for inexperienced dog lovers. •	Great in Cold Weather climates. Not a hot climate dog, black and thick coats.